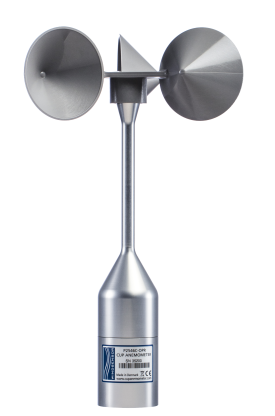 The P2546C, manufactured by WINDSENSOR, is a Class 1 cup anemometer commonly used in wind resource assessment and power performance applications. Each anemometer is individually calibrated compliant with IEC 61400-12-1 and is shipped with a MEASNET calibration certificate. The P2546C features a durable construction and is suitable for both on-shore and off-shore environments. The “C” version of this sensor (coil version) contains no mercury and is compatible with all Campbell Scientific measurement and control data loggers. The P2546A (reed switch version) is also available.